Engagement on the Apple App Store has risen significantly following the release of iOS 11 in September 2017. The unintended browsing of the App Store is fast becoming more important for game and app discovery. 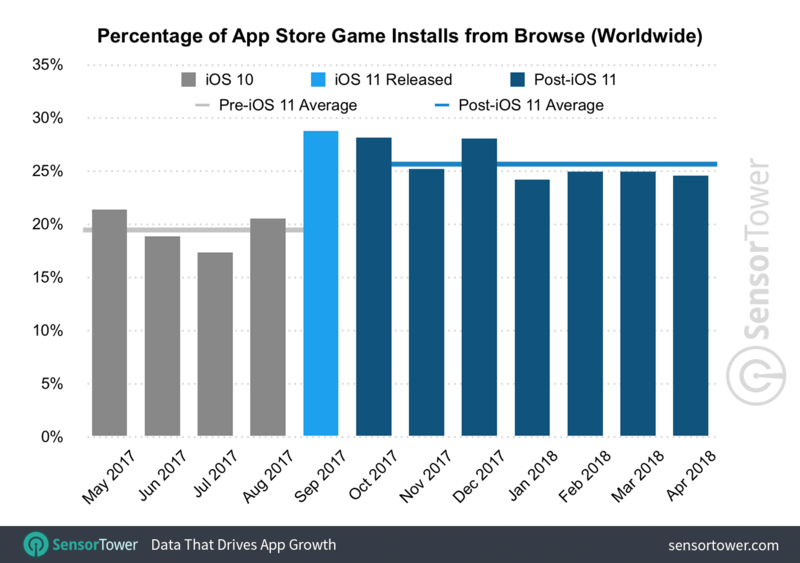 A recent report from Sensor Tower depicts that downloads of game and non-game apps during the unintended browsing have increased post iOS 11. The app discovery on App Store has always been the biggest challenge for iOS app developers. However, Apple Inc. (NASDAQ:AAPL) has been making considerate efforts to prep its App Store, especially after iOS 11 redesign. The Cupertino giant has been warning its developers to build apps that strictly comply with the App Store Guidelines, also, to make the use of only SDK iOS 11 to write apps. All the moves seem to have paid off pretty well. The iOS 11 redesign has brought more curated content on the front with regular “App of the Day” and “Game of the day sections”. According to Sensor Tower, featured apps on iOS 11 have received a download boost of up to 800% in the US. The most frequent publishers are game makers as games made up about 67% of the total U.S App Store downloads in 2017. Moreover, game downloads saw a +802% increase (U.S) in weekly downloads if they were chosen by Apple to feature in Today Tab. Browsing Is More Important For App Discovery On App Store Than Through Keywords Or Referrals? As per the latest data, browsing the App Store has accounted for over 15% of downloads from browse in Q4 2017 and April 2018. Browse downloads dipped in Q1 2018 after the initial craze around the new App Store, yet it remained above pre-iOS 11 level. 4 months prior to the launch of iOS 11, the proportion of downloads from browse was nearly 10%. Furthermore, an average 26% of all iOS game downloads now come from browsing the App Store in the months following the Apple’s iOS 11 redesign, based on the study conducted by App Store download sources. Prior to September 2017, game installs from browsing the App Store registered 19% of all game downloads. Battle Royale games like PUBG Mobile and Fortnite have witnessed surging popularity on App Store. PUBG Mobile was the top game on iOS by downloads in Q1 2018. Developers and game publishers are even capitalizing on advertising their games in different apps, as 17% of game downloads came via referrals from other apps. Although the majority of downloads on App Store is through Search or typing keywords, the method is more preferred for non-gaming apps. In the study of app downloads between and May 2017 and April 2018, 65% of the overall downloads came from search and among that 56 % were games and 69% came from non-game apps. Apple App Store currently hosts more than 2.1 million apps and almost 1/4th of them are gaming apps. The first-time app downloads on the App Store reached 7.8 billion in Q1 2018. App developers and publishers always run the risk of getting lost in the shuffle unless their apps create a major buzz or have a marketing push behind them. The app discovery on App Store is crucial for developers as, unlike Android, it is the one and the only platform for selling and downloading apps for iPhones or iPads. Android users download apps through the Google Play Store, but they can also download apps from many third-party app stores as well. Improving visibility on the App Store is more important and the developers can abide by some rules to increase their chances of getting picked, like maintaining an all-time rating of 4.5 stars. Additionally, securing featuring from Apple can prove to be highly profitable for app developers. Apple is readily curating content and highlighting certain popular apps on the App Store, so the people browsing through the App Store are more likely to check-out featured apps. Also, if a user searches for an app and finds a featured alternative, he is more likely to go for the latter.